Lil Wayne covers his first magazine since he was released from Rikers in November. Looking all extra buffed out. 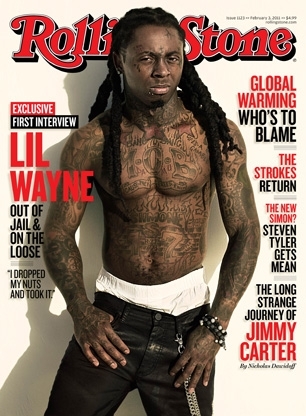 Back in Feb, 2010 when Wayne was about to head to jail, Weezy also graced the cover of the Rolling Stone Magazine. This new issue will hit the news stands on January 21st, and below is a special treat with some behind the scenes footage of the photo shoot !